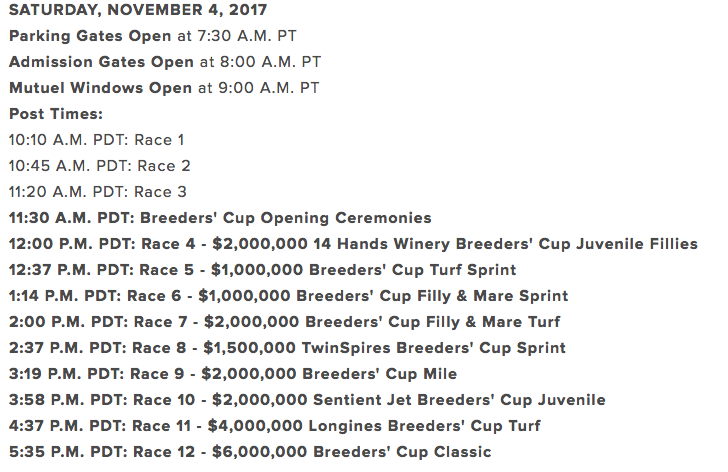 ARCHIVES: BREEDERS’ CUP 2017 | COFFEEBREAKWITHFRIENDS! We look forward to hearing from you! 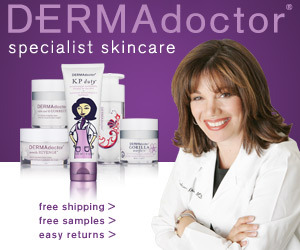 Check out our comments at the end of the page! 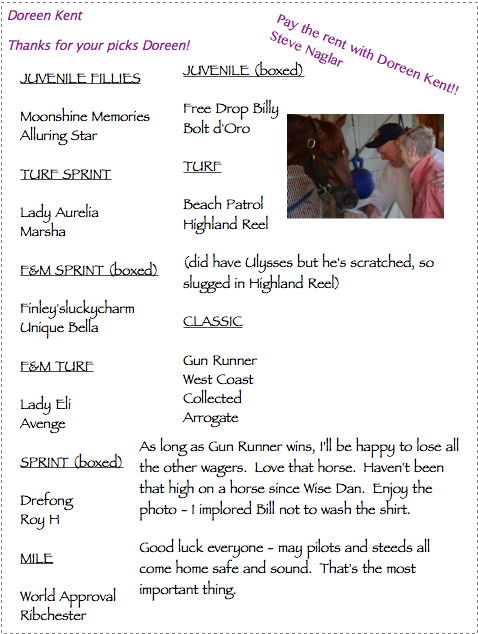 Check out the comments and picks sent in by our avid racefans at the end of the page! CONGRATS TO TEAM GUN RUNNER! DEL MAR, Calif. – As trainer Steve Asmussen made his way through the fading light of Del Mar racetrack shortly after sundown on Saturday night, just minutes after his horse Gun Runner had outrun 10 others in the $6 million Breeders’ Cup Classic, Jill Baffert saw him walking through the paddock and ran over. Gun Runner earned a career-high Beyer Speed Figure of 117 for his win in the Breeders’ Cup Classic. “It was our turn, right?” Asmussen said. Gun Runner’s turn was more than seven months in the making. Back in March, he had finished second to Arrogate in the Dubai World Cup. But until Saturday, they had not met since. In that time, Gun Runner had won three straight races, while Arrogate had lost twice. 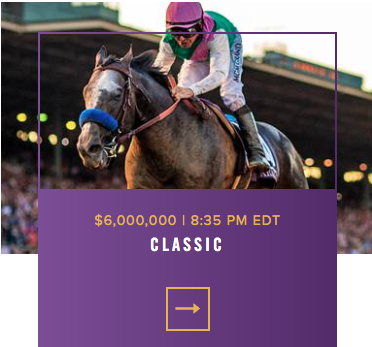 If either won the Classic, that horse would be Horse of the Year and champion older dirt male. It was no contest. Arrogate, favored at 2-1, took a left-hand turn leaving the gate from his rail draw, found himself well back over a track where he lost twice this summer, and could only rally for a dead-heat for fifth, his third straight loss in what was the final start of his career. Gun Runner, meanwhile, proved again he needed no excuses – not pace, not surface, nothing. His remarkable consistency had carried him to five wins in his prior six starts, the lone setback being when Arrogate turned in a Herculean effort in Dubai. This time, Gun Runner would be tested the whole way, setting a swift pace while racing on what may have been the worst part of the track, and he still turned in the fastest race of his career. Gun Runner ($6.80), hounded by Collected the whole way and through fractions of 22.50 seconds for the opening quarter, 46.31 seconds for a half, and 1:10.50 for six furlongs, turned back Collected’s bid in upper stretch and was pulling away anew in deep stretch to win the Classic by a widening 2 1/4 lengths. He covered 1 1/4 miles on the fast main track in 2:01.29, which translated into a Beyer Speed Figure of 117, the highest of his career. Collected, racing over a track he adores and at which he won the Pacific Classic during the summer meet, finished second, 1 1/4 lengths in front of West Coast, with War Story fourth. Arrogate and Gunnevera finished in a dead-heat for fifth, then came Churchill, Mubtaahij, War Decree, Pavel, and Win the Space. For Gun Runner, 4, this was his fifth win in six starts at five different racetracks in 2017. He has now won 11 times in 18 starts at 10 different racetracks. And he won for the first time going 1 1/4 miles after finishing second once and third twice in three prior attempts. “Is there anything he hasn’t done?” a playful Asmussen said as he walked through the tunnel heading to the paddock after the race. Gun Runner, starting from post 5, was angled off the rail leaving the gate by jockey Florent Geroux, but he still was closer to the rail than Collected over a surface where inside runners had not fared well this week. Geroux said Gun Runner was “very comfortable” despite setting the rapid pace. At the quarter pole, “I said, ‘Let’s go,’” Garcia said. Through the lane, Garcia said he angled Collected away from Gun Runner because he knows Gun Runner likes to fight. “I know he’d respond,” Garcia said of his respect for Gun Runner. “My horse tried. I couldn’t do anything. Gun Runner is a really good horse. He got a good position, and I had to let my horse run a little early to get position. Gun Runner had spent the past month in California, first at Santa Anita, and then for the past 1 1/2 weeks at Del Mar, part of a plan that was months in the making. Gun Runner was given an ambitious schedule, but Asmussen said he recovered from his works and his races better as the year progressed. Gun Runner won the Stephen Foster in June, then the Whitney and Woodward at Saratoga, all after returning from Dubai. He then was pointed for the Classic. 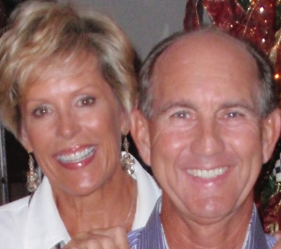 He had four works at Santa Anita, and one at Del Mar, with assistant Scott Blasi overseeing the day-to-day care during the California stay. “The way that he has taken his races, the way that he’s coming out of them, me and Scott were just marveling at him this week how strong he looked schooling this week,” Asmussen said. Gun Runner then schooled his competition in his first start at Del Mar. He earned a first prize of $3.3 million, putting his career earnings just shy of $9 million. There may be more for Gun Runner. Ron Winchell, whose Winchell Thoroughbreds owns Gun Runner in partnership with Three Chimneys Farm, had said previously that the Pegasus World Cup in January at Gulfstream was a possible next start for Gun Runner, and that it was “50-50” whether Gun Runner would race all of 2018. But on Saturday night, Winchell and Asmussen and Goncalo Borges Torrealba of Three Chimneys all dodged questions about Gun Runner’s plans, not to be coy, but, it seemed, simply because they wanted to enjoy, just for a little bit longer, the satisfaction of having seen a months-long plan come to fruition. 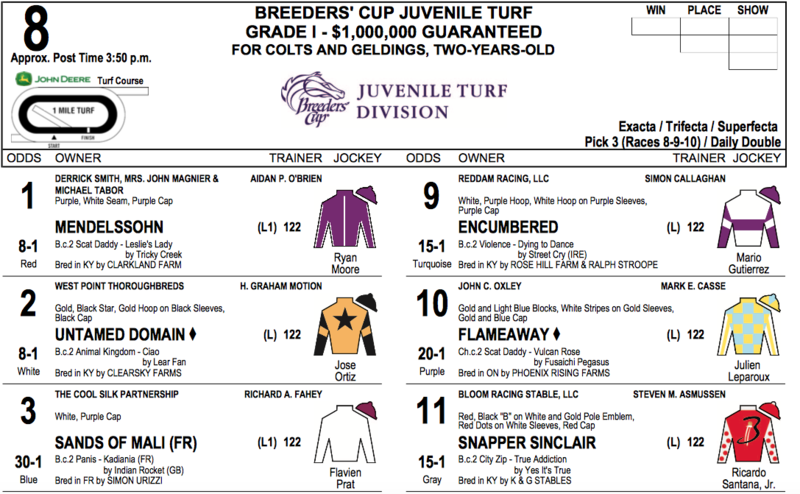 was withdrawn from the Breeders’ Cup Turf Friday evening. 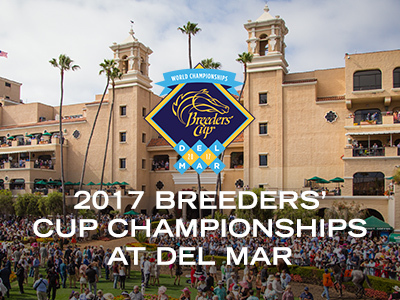 DEL MAR, Calif. – Ulysses, the 7-2 favorite for Saturday’s Breeders’ Cup Turf, was withdrawn on Friday evening because of soundness issues. Ulysses is scheduled to go to stud at Cheveley Park in England in 2018 and is not expected to race again. Owned by the Niarchos Family’s Flaxman Holdings, Ulysses won 5 of 13 starts and earned $2,544,053. 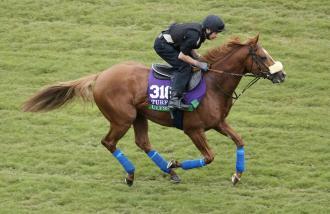 Trained by Michael Stoute, Ulysses won 3 of 6 starts and earned $2,242,047 this year. By Galileo, Ulysses won two Group 1 races – the $644,400 Coral Eclipse Stakes at Sandown Park in July and the $1.28 million Juddmonte International at York in August. In his final start, Ulysses was third in the Group 1 Prix de l’Arc de Triomphe at Chantilly Racecourse in France on Oct. 1. 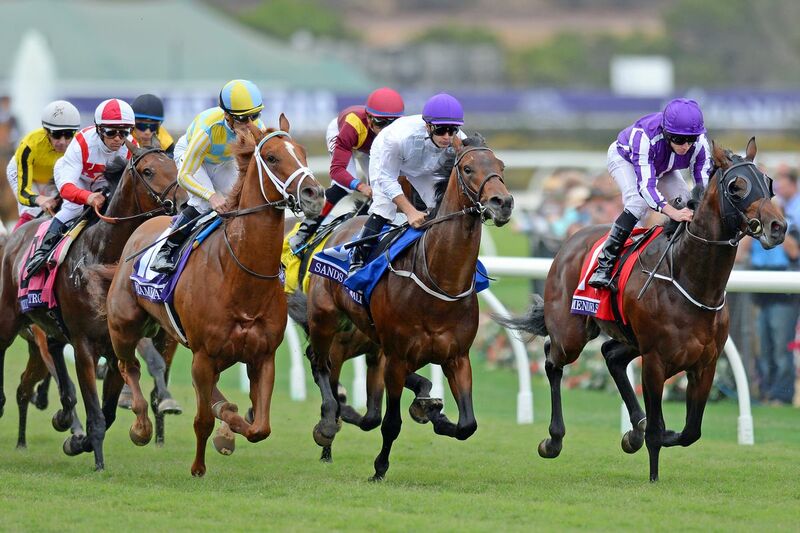 The $5.9 million Arc is Europe’s richest race. The absence of Ulysses will make Beach Patrol and Highland Reel the first two choices in the betting. Beach Patrol won the Grade 1 Joe Hirsch Turf Classic at Belmont Park in his last start on Sept. 30. Highland Reel was third in the Group 1 Champion Stakes at Ascot on Oct. 21. DEL MAR, Calif. – Arrogate, the defending race winner in the Breeders’ Cup Classic, will leave from post 1 in this year’s race at Del Mar on Saturday after drawing the inside in a field of 11 on Monday, a situation his jockey, Mike Smith, said will cause him to be aggressive leaving the gate. Arrogate is the 2-1 second choice on the morning line for the Classic, the $6 million, 1 1/4-mile race that will determine Horse of the Year. Russell Hudak, who makes the morning line at Del Mar, established Gun Runner, winner of his last three starts and runner-up to Arrogate in the Dubai World Cup, as the 9-5 favorite. Mike Watchmaker, Daily Racing Form’s national handicapper, has Gun Runner at 8-5. Gun Runner drew post 5. 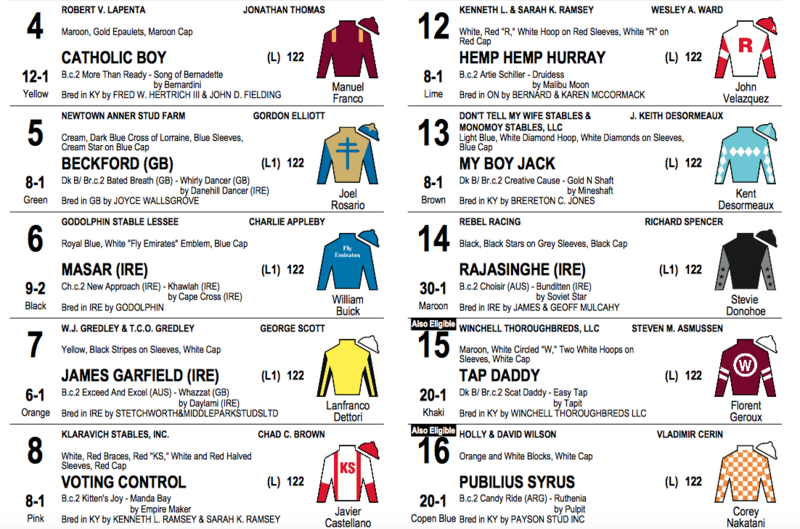 From the rail out, the Classic field is Arrogate, War Decree, Win the Space, War Story, Gun Runner, Mubtaahij, Churchill, West Coast, Gunnevera, Pavel, and Collected. 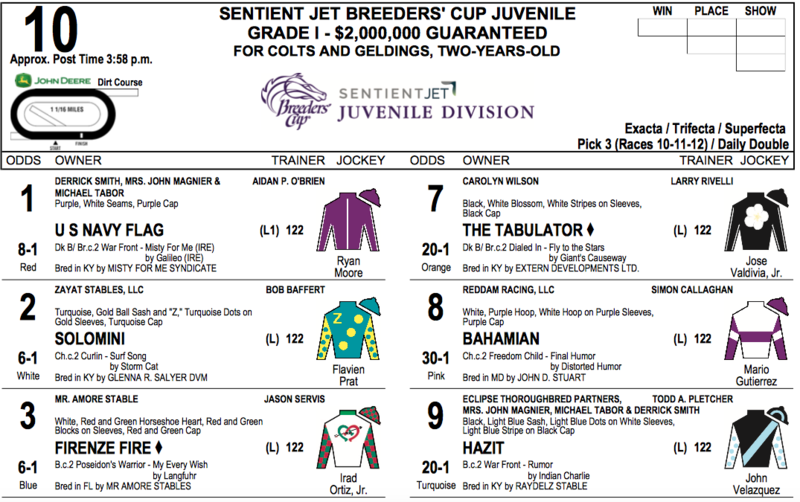 Bob Baffert, the trainer of Arrogate, has three other runners – Collected, Mubtaahij, and West Coast. 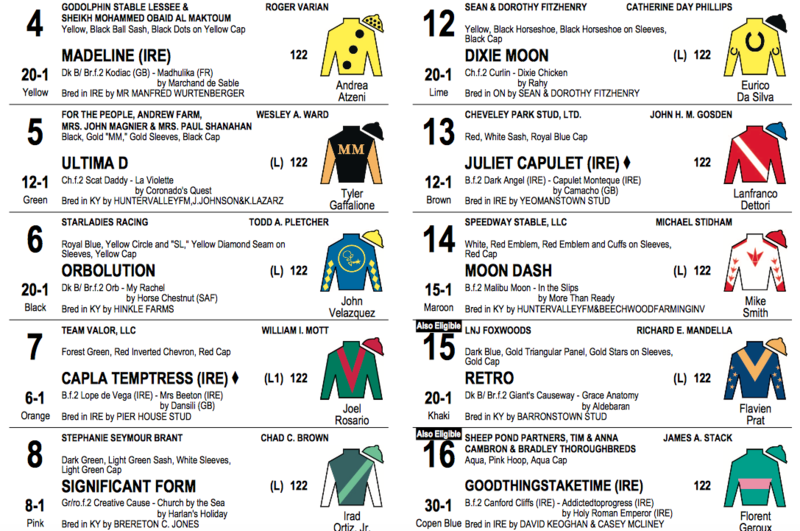 This is the first time a trainer has run more than three horses in the Classic. Churchill could have run in the Mile on turf, but went here. War Decree could have gone on the Dirt Mile, but also went here. War Story could have gone in the Turf but went here. All three of those moves were telegraphed in the past 24 hours. 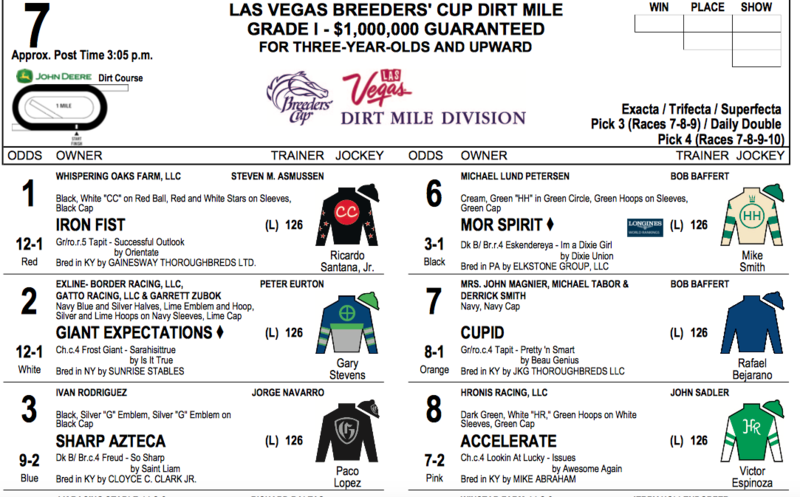 Cupid, as expected, was put in the Dirt Mile. 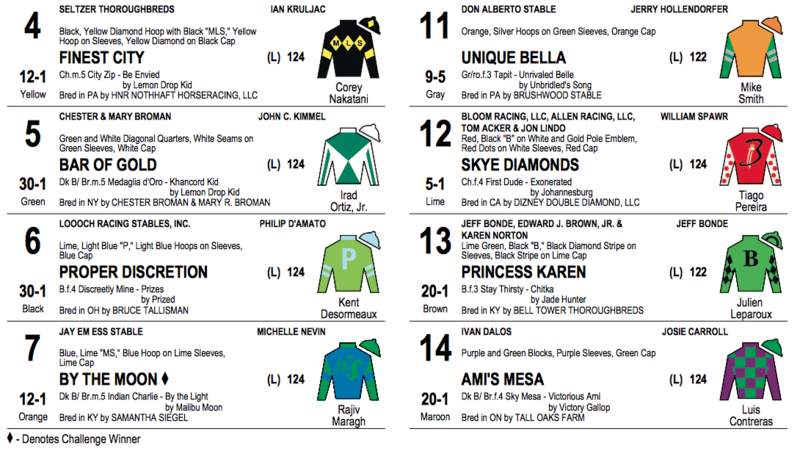 The Classic will be the last of 13 Breeders’ Cup races that will be run at Del Mar, four on Friday and nine Saturday. 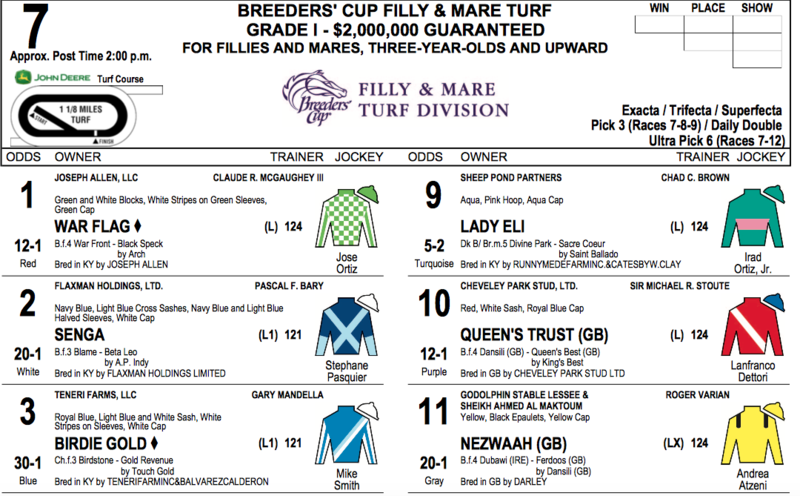 This is the 34th Breeders’ Cup, the first at Del Mar. 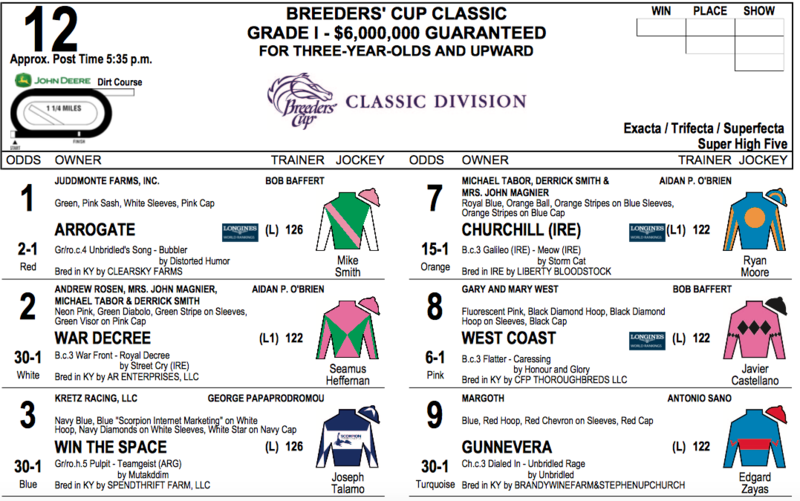 There are nine previous Breeders’ Cup race winners, including seven from last year. 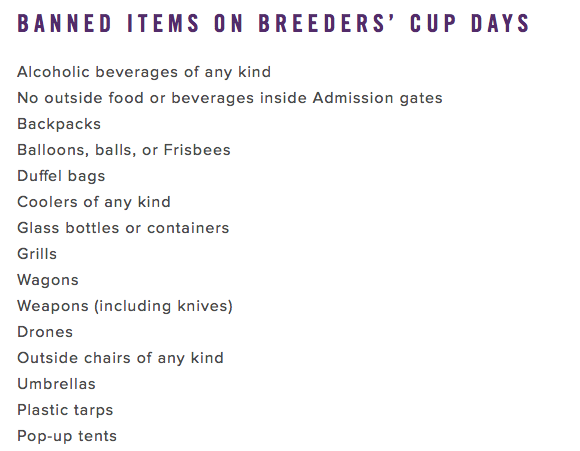 A total of 168 horses were entered Monday in the 13 Breeders’ Cup races. Four races drew so many entries that they overfilled, and the maximum two also-eligibles were drawn, too. Another three races drew the maximum field but had no also-eligibles. 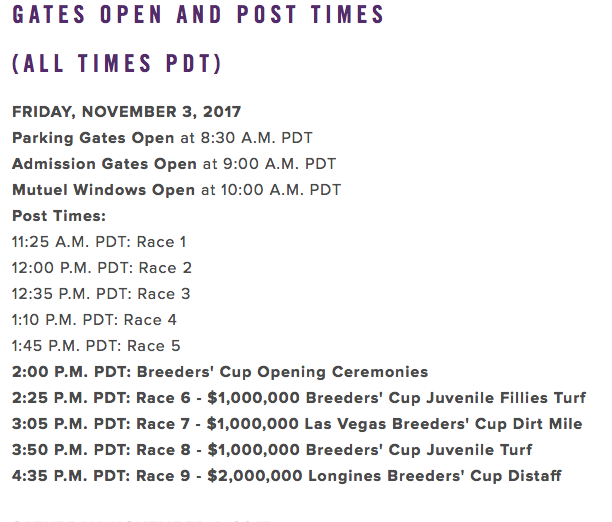 Scratch time for all the Breeders’ Cup races is Friday morning, which is the last chance the also-eligibles will have to get in. Pre-entries were submitted last week. Final entries were due Monday, and posts drawn later in the day at a ceremony at the beach. 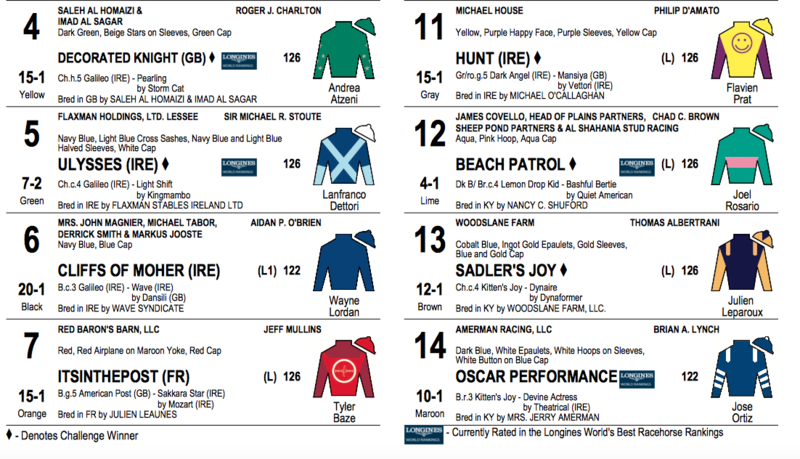 Although there were scenarios under which some horses could have entered two races – the two races don’t overfill, one is on Friday, the other Saturday – horses like Practical Joke (who goes in the Dirt Mile on Friday) and Mind Your Biscuits (who goes in the Sprint on Saturday) did not use that option. 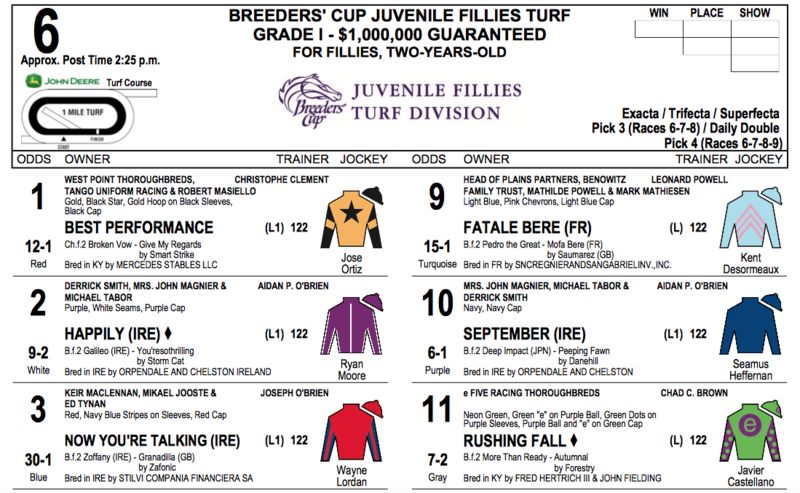 Juvenile Fillies Turf – Rushing Fall, unbeaten in two starts, is the 7-2 favorite on Hudak’s line in a full field of 14 that has two also-eligibles. Daily Racing Form’s Brad Free made Rushing Fall the 4-1 favorite. 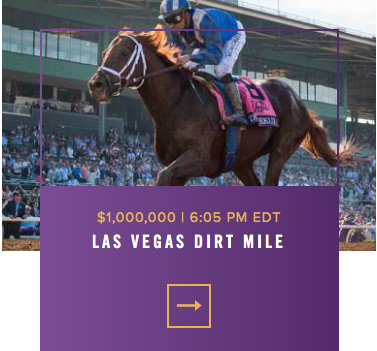 Dirt Mile – This field was reduced to 10 when horses like Midnight Storm (Mile on turf) went elsewhere. Met Mile winner Mor Spirit is the 3-1 favorite on the lines of both Hudak and Free. 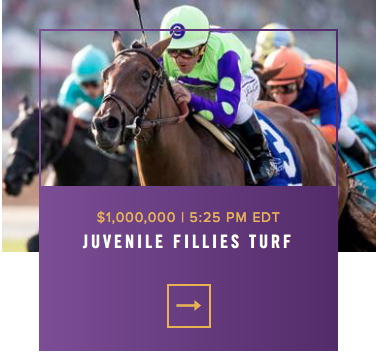 Juvenile Turf – As with the Juvenile Fillies Turf, there was a full field of 14, plus two-also-eligibles, entered in this race. Masar, a European import, is the lukewarm 9-2 choice on Hudak’s line, but he has seven runners priced at 6-1 or 8-1, illustrative of the wide-open nature of the race. Free has Masar favored at 4-1. With U S Navy Flag going to the Juvenile, and Nelson not shipping from Europe, that allowed My Boy Jack and Snapper Sinclair to get into the main body of the race. They were the first two excluded at the pre-entry stage last week. Mendelssohn went here; he was pre-entered in the Juvenile, too. 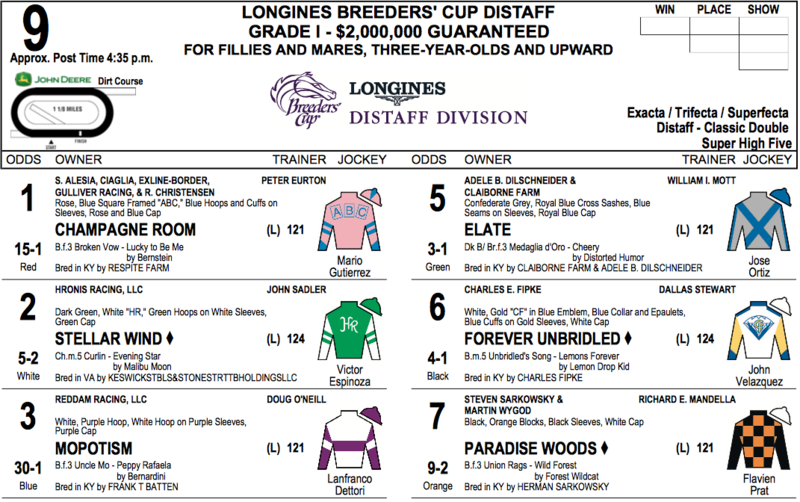 Distaff – Stellar Wind is the 5-2 favorite of both Hudak and Free in an eight-horse field, the event’s smallest field. 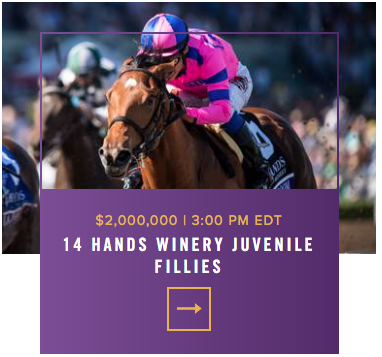 The field includes Champagne Room, winner last year of the Juvenile Fillies, as well as this year’s Kentucky Oaks winner, Abel Tasman. 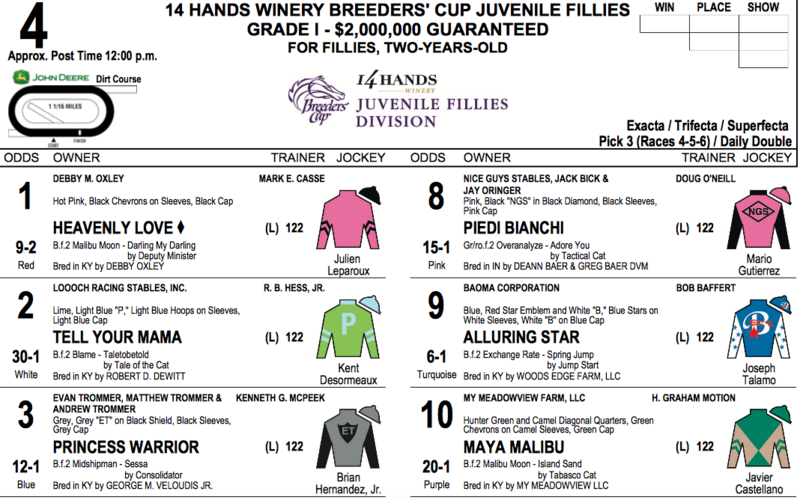 Juvenile Fillies – The unbeaten Moonshine Memories heads a field of 13 and is the 7-2 favorite on Hudak’s line. Watchmaker has Moonshine Memories favored at 3-1. 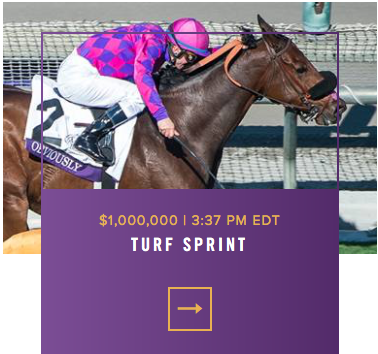 Turf Sprint – Five-furlong grass races at Del Mar can only handle 12 runners, and this race drew a full field, plus two also-eligibles. The globetrotting Lady Aurelia is the 5-2 favorite on Hudak’s line. Watchmaker has her much lower, at 8-5. 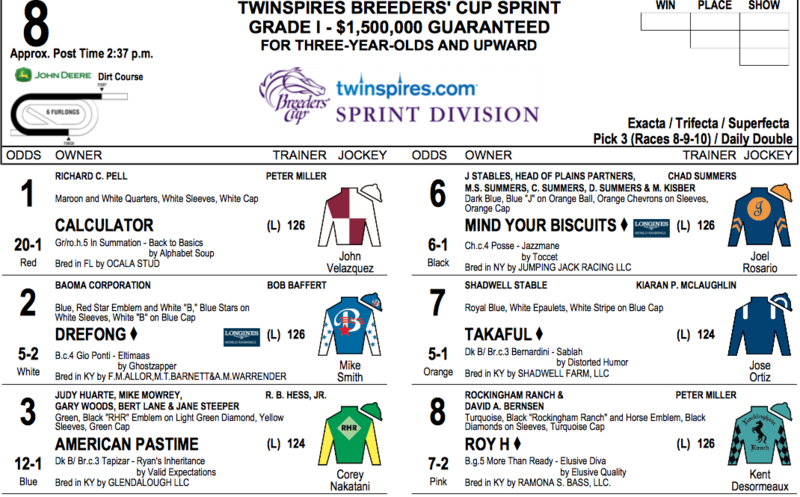 B Squared would have been the first horse on the also-eligible list, but his connections opted for something more certain and put him in the Sprint, which did not overfill. Mongolian Saturday, who won this race two years ago, is 20-1. 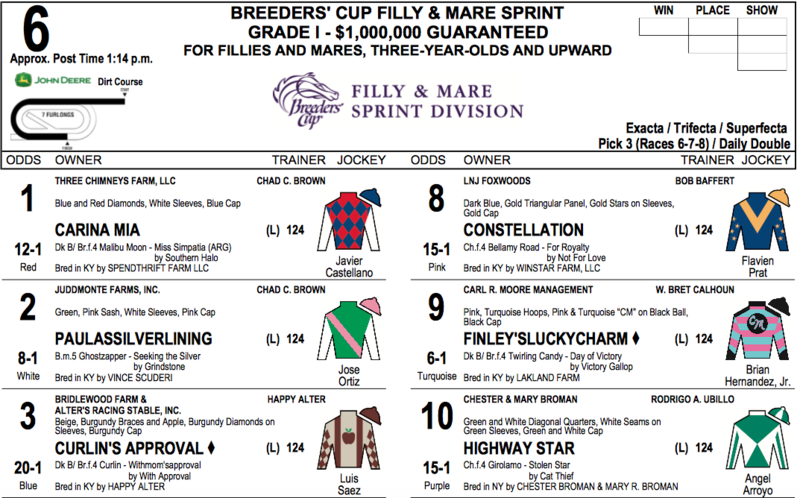 Filly and Mare Sprint – Unique Bella tops a full field of 14 and is the 9-5 favorite on Hudak’s line and is 8-5 with Watchmaker, but the brilliant 3-year-old filly has to face several top-class older runners, including Skye Diamonds, By the Moon, Paulassilverlining, and the defending champion, Finest City. 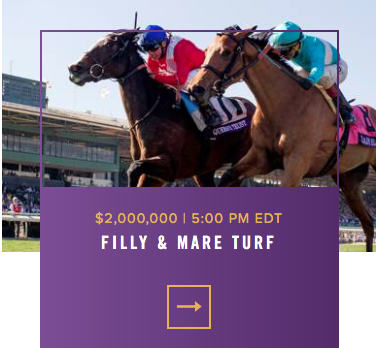 Filly and Mare Turf – Lady Eli, bound for the Hall of Fame, is the 5-2 favorite of both Hudak and Watchmaker in what will be the final start of her dramatic career. She is seeking a second Breeders’ Cup win, having captured the Juvenile Fillies three years ago. 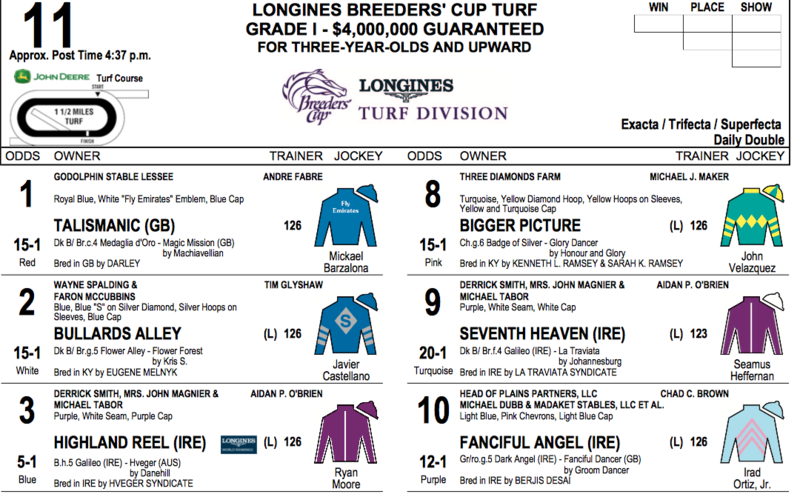 Her rivals include Queen’s Trust, who nosed out Lady Eli in this race last year. There were 14 entered in here, plus two also-eligibles. 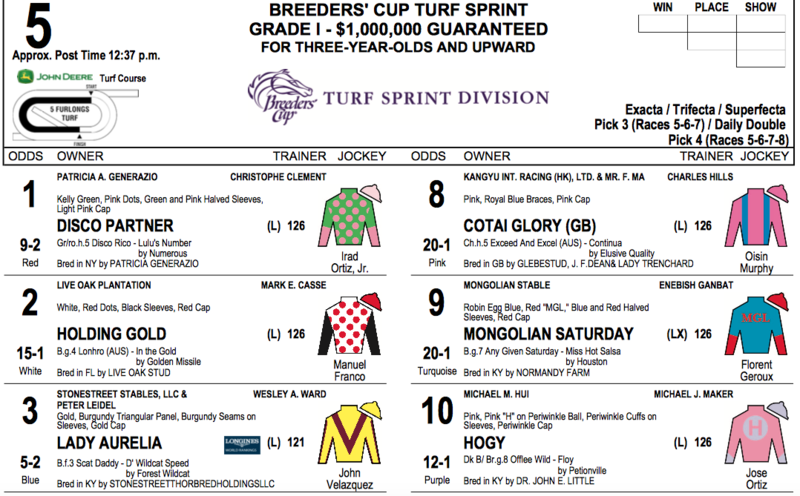 Sprint – Defending champion Drefong will have to leave alertly, having drawn post 2 in a field of 10 over a course where he made a left-hand turn at the gap the last time he raced here. He is the 5-2 favorite of both Hudak and Watchmaker. 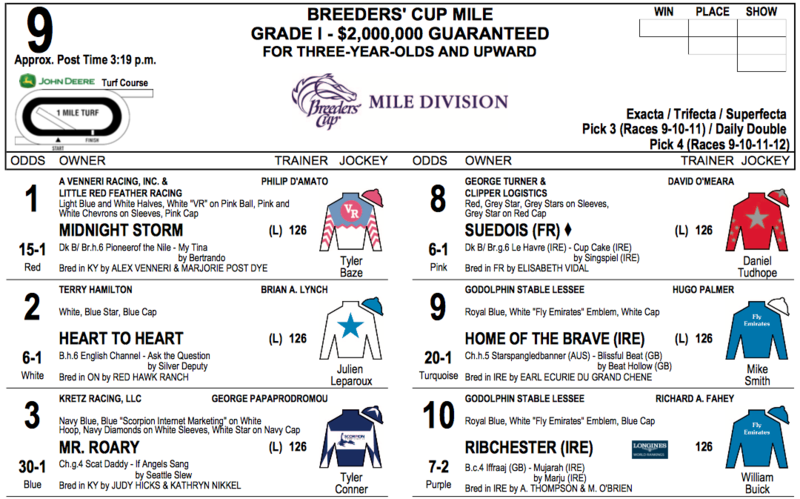 Mile – A full field of 14 was entered, headed by European star Ribchester, who is the 7-2 favorite on Hudak’s line and is 5-2 on Watchmaker’s line. Roly Poly went here instead of the Filly and Mare Turf, something colleague Marcus Hersh hipped you to in recent days. Midnight Storm also went here instead of the Dirt Mile. 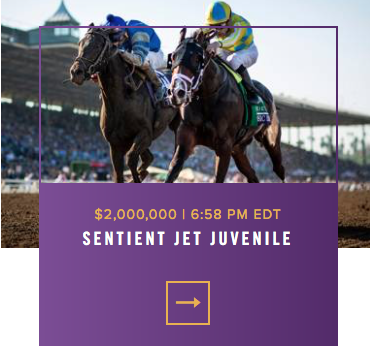 Juvenile – Bolt d’Oro will have to overcome post 11 in a field of 12 to keep his unbeaten record intact. He is the 9-5 favorite on Hudak’s line, but is a far shorter 6-5 on Watchmaker’s line. 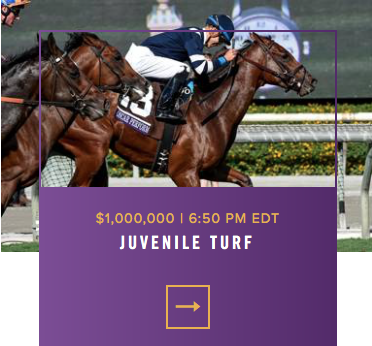 Mendelssohn went in the Juvenile Turf, but U S Navy Flag was put in here. Both are Coolmore-owned runners. 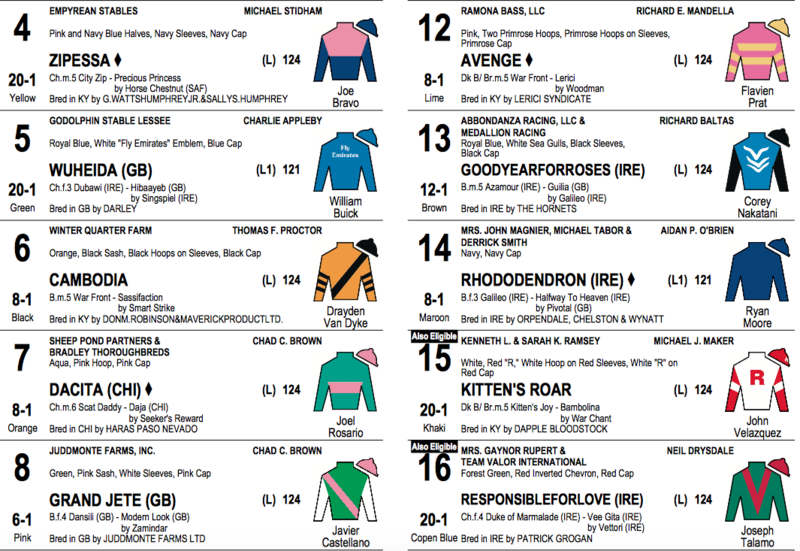 Turf – Another full field of 14, with defending race winner Highland Reel and last year’s Juvenile Turf winner, Oscar Performance, entered. European star Ulysses is the 7-2 favorite on Hudak’s line and is the 3-1 favorite on Watchmaker’s line. Forever Unbridled captured the Longines Distaff on Friday, capping off the first day of the 2017 Breeders’ Cup at Del Mar Racetrack in San Diego, Calif.
John Velasquez rode Forever Unbridled, who had 4-1 odds, to win the 1 1/8-mile race of females three years and older, and held off a late charge by Abel Tasman down the stretch in the fourth and final race of Friday at Del Mar. The third time was not the charm for pre-race favorite Stellar Wind, the 5-year-old who finished last on Friday. Stellar Wind finished second in the Distaff in 2015, and fourth last year. Jockey Ryan Moore and trainer Aidan O’Brien teamed up for their fourth Juvenile Turf win in the last seven years, guiding Mendelssohn to the win this year in the battle of 2-year-olds. Moore has ridden winners in this race with Wrote (2011), George Vancouver (2012) and Hit It A Bomb (2015). Javier Castellano, who rode Cloud Computing to a win in the Preakness Stakes in May, won the Juvenile Fillies Turf for the second year in a row. He rode 3-1 favorite Rushing Fall to a victory in the one-mile race, beating out Best Performance and September. Certainly the talk almost all year in the classic division has been about Arrogate but with losses in his last two races and Gun Runner’s emergence winning his last three (all grade ones.. Stephen Foster, Whitney and Woodward) the pendulum has swung to Gun Runner even though Arrogate best him in their only head to head meeting in the Dubai World Cup. Both Arrogate’s losses were in Del Mar which may not be his favorite track but that’s where the Breeders Cup is so he will again need to deal with it. Like most really good horses both horses have won over five different surfaces which tells us that they don’t really need a certain track to do their best so I don’t buy the argument that Arrogate dislikes Del Mar as the sole excuse for his loses. I think the miles have caught up with him and his best races are behind him where Gun Runner’s best races still lay ahead. The question is whether Arrogate can still win with less than his best. With Collected, Diversify and Midnight Storm there is plenty of early speed to occupy Gun Runner and but he has shown the ability to rate slightly off the early lead, and early last year in Louisiana he sat in the pocket and came with that move on the turn to win both the Risen Star and Louisiana Derby. But I don’t think he’ll be in a pocket, more likely stalking the lead which he has done brilliantly in his last two wins.. and of course if for some strange reason he gets an easy lead then it’s game set and match.. but I cant see that happening. As I’ve said before, the reason I like him over Arrogate now is that he is still improving and Arrogate is not. But if he does get embroiled in a hot pace up front early, Arrogate and West Coast are the most Likely beneficiaries with Arrogate the better of those two. 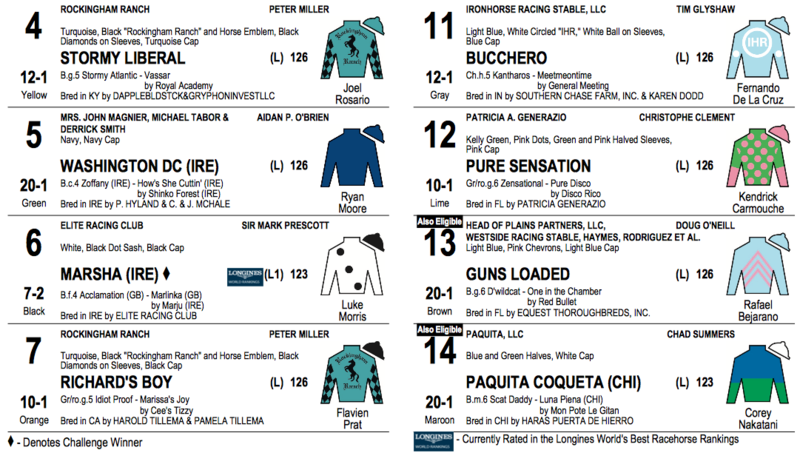 Of the other closers that would have a punchers chance, Gunnevera and Keen Ice are the most likely to have an effective closing run good enough to get a piece of the purse, with Mubtaahij from his win in the Awesome Again possibly as well. As good as Collected ran in winning the Pacific Classic, he will get a lot of heat up front early from Diversify and Gun Runner and the distance will prove too much for him. West Coast…Is he this year’s Arrogate? He didn’t make his first career start until February and he missed all three TC races yet here he is as the top three-year-old in the land based upon his wins in the Los Alamitos Derby, Travers, and Penn Derby. It’s not just his wins in those but the way he won. Very easy and very fast. He has speed but will likely sit off the lead just a bit and we will see just how good he is. He loses Mike Smith but gets Javier Castellano in the saddle so he loses nothing there. He’s a really big and long-striding colt and hasn’t shown that he’s very nifty so he will need a traffic-free trip. War Decree is one of the two Aidan Obrien euro invaders and although he comes off an unbelievably easy win on the synthetic of Dundalk, the two just behind him in second and third were both mares and neither has won a graded stake… in other words, he wasn’t beating much that day. Churchill is the other Obrien runner and although he is a four-time grade one winner including two this year, all of those were on the grass and he comes off a bit of a disappointing 7th place finish just a couple of weeks ago at Ascot on Champions Day. Collected-Undefeated in 2017 going 4 for 4 including the Grade one Pacific Classic over Arrogate. In many other years, he would be one of the favorites but he may not even be in the first three choices. The reason is because of his style and that is speed..although he has stalked the early leaders and been successful, at this distance he will be really close and have little or no chance to “catch his breath” anytime in this race. Diversify will likely lead and Gun Runner, Pavel and maybe even West Coast will all be somewhere close to this guy will be under pressure the entire trip and I don’t think he’s up to that kind of trip. Diversify- the most likely speed of the race comes off a three-race winning streak including the JC Gold Cup in his last and all very fast races. I don’t think he can carry that speed the entirety of the race with these horses but he will keep them all honest. Mubtaahij-he comes off a win in the Awesome Again a month ago but he didn’t and hasn’t run fast enough to beat at least four of these in here. Gunnevera-Comes off a career-best effort in the Travers to West Coast but even that effort wasn’t good enough to win. Will appreciate the solid pace up front but simply not good enough in my eyes. Win the Space. Only two starts this year. neither a win and like others in here his best lifetime effort int good enough to beat at least four and maybe five in here. He does come from back in the pack and hopefully won’t get in anyone’s way. Churchill.. so this is a shot in the dark but this colt didn’t look too impressive running 7th in the Irish Champions stakes on Sept 9, but came back with a better performance in the QE 2 stakes at Ascot just two weeks ago for a third-place finish to Persuasive and Ribchester at one mile which is a better distance for him I believe , so this is distance is approaching his limits, over a dirt surface he’s never run over and it’s back in two weeks after a solid 2017 campaign and an international trip.. He’s really good but this is a lot to ask..
but then again, nothing to lose. Pavel is sort of a wildcard in here for me. Four months ago he hadn’t even started in a race and now he’s in the Classic. I don’t think he’s fast enough but he has surprised me more than once in his brief career. After breaking his maiden he was asked to run in the Jim Dandy stakes and I thought he was a winner at the top of the stretch as he moved up to challenge the Derby and Preakness winners but he settled for fourth. He came back and was an impressive winner in the Smarty Jones at Parx then third beaten less than two lengths in the JC Gold Cup. He would have to run faster but he is on the improve and he could get a good stalking trip.. maybe third? Post time: 5:25 p.m. Purse: $1 million. Distance: 1 mile for 2-year-olds. Post time: 6:05 p.m. Purse: $1 million. Distance: 1 mile for 3-year-olds and up. 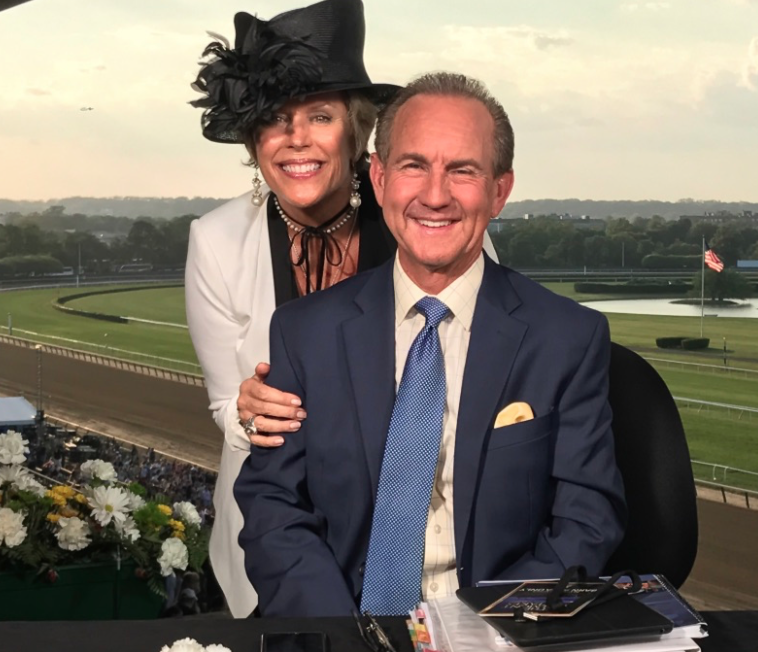 Post time: 6:50 p.m. Purse: $1 million. 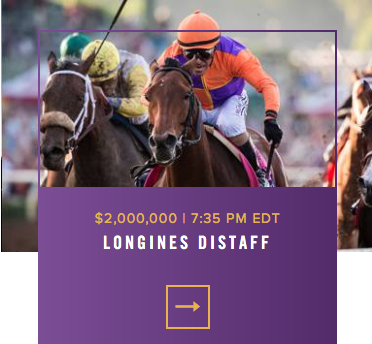 Post time: 7:35 p.m. Purse: $2 million. 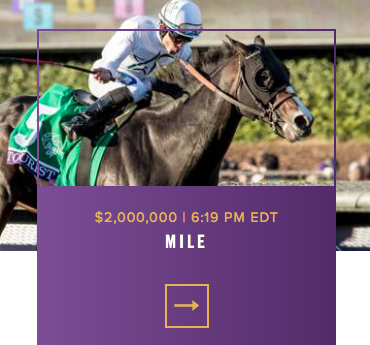 Distance: 1 1/8 miles for 3-year-olds and up. Post time: 3 p.m. Purse: $2 million. Distance: 1 1/16 miles for 2-year-olds. Post time: 3:37 p.m. Purse: $1 million. Distance: 5 furlongs for 3-year-olds and up. Post time: 4:14 p.m. Purse: $1 million. Distance: 7 furlongs for 3-year-olds and up. Post time: 5 p.m. Purse: $2 million. Post time: 5:37 p.m. Purse: $1.5 million. Distance: 6 furlongs for 3-year-olds and up. Post time: 6:19 p.m. Purse: $2 million. Post time: 6:58 p.m. Purse: $2 million. Post time: 7:37 p.m. Purse: $4 million. Distance: 1 ½ miles for 3-year-olds and up. Post time: 8:35 p.m. Purse: $6 million. Distance: 1 ¼ miles for 3-year-olds and up. for Arrogate’s disappointing races at Del Mar last summer. It was proven not to be an idle boast. Arrogate followed up the Travers by running down California Chrome in the Breeders’ Cup Classic at Santa Anita. 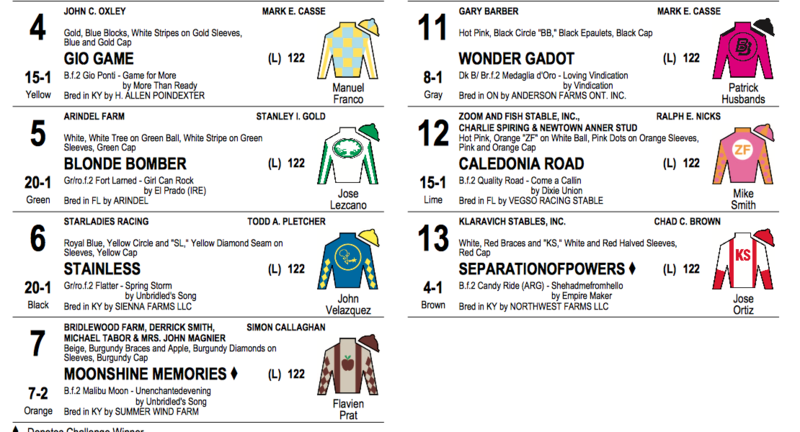 He then won the inaugural Pegasus World Cup at Gulfstream. He had run three straight races with monster Beyer Speed Figures of 122, 120, and 119. 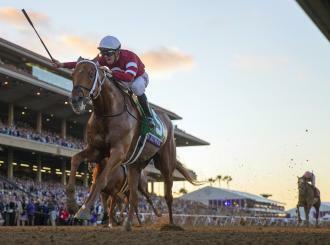 And then on March 25, he turned in a breathtaking performance in the Dubai World Cup, overcoming a dreadful start to reel in the high-class Gun Runner. He was ranked as the best horse in the world – not just by Baffert but by an international panel of racing secretaries. 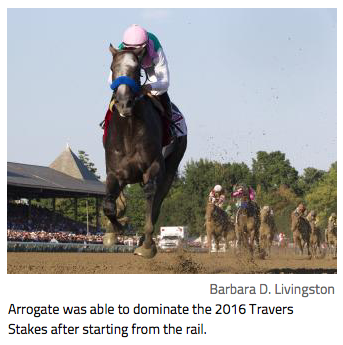 Now it was five months on from Dubai, and Arrogate had lost two straight races. Horse of the Year, which seemed a certainty in the spring, was now in jeopardy. There would be one more chance for Arrogate before he went to stud at Juddmonte Farms. 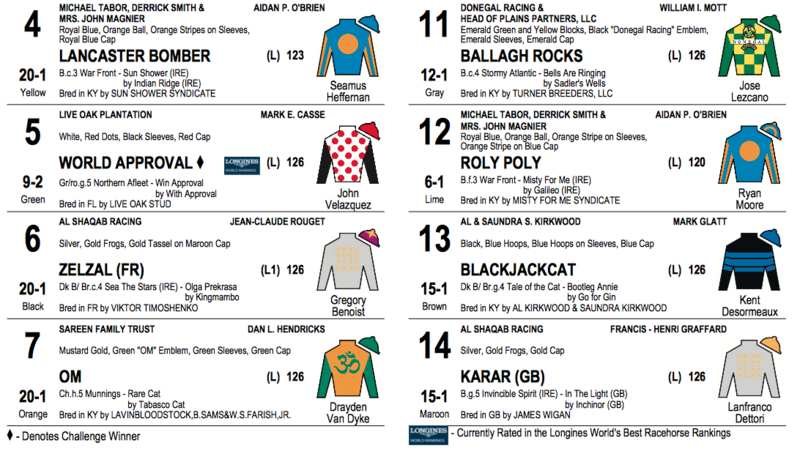 That race is Saturday, in the Breeders’ Cup Classic at Del Mar. It is a pivotal race for Arrogate’s career. A victory would make him only the second horse to win the Classic twice, and make him both Horse of the Year and champion older male on dirt for 2017, adding to the champion 3-year-old male title he won in 2016. A loss means Arrogate will retire with a three-race losing streak. “I like a challenge,” Baffert said in late August, when he set about planning for the Classic, working backward from Nov. 4 with a general outline. American Pharoah had lost the 2015 Travers, and then came into the Classic fresh, without a prep, and crushed his rivals. Mistakes had been made at Saratoga, particularly an overaggressive gallop the day before that Travers. After that race, American Pharoah had a few easy weeks, and then had a strong series of works leading up to his career finale. Baffert believed there were similarities regarding Arrogate in that mistakes had been made, with Baffert placing the biggest blame on himself for running in the San Diego. He thought there were adjustments that could be made, too, in daily gallops and race tactics. As with American Pharoah, Arrogate had a light late August and early September, then started training in earnest for the Classic. 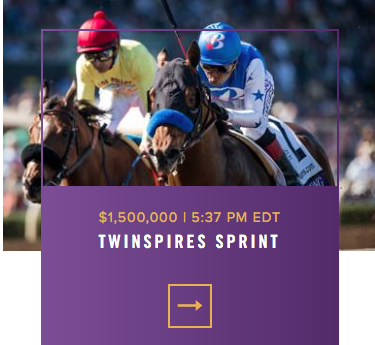 He also would have all his workouts at Santa Anita and ship in just days before the Classic. 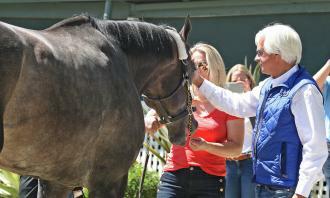 “Freshen him up, like for other big races, and take one shot at it,” Baffert said. On Sept. 26, Arrogate sped five furlongs in 59.40 seconds, the best time of 44 at the distance. 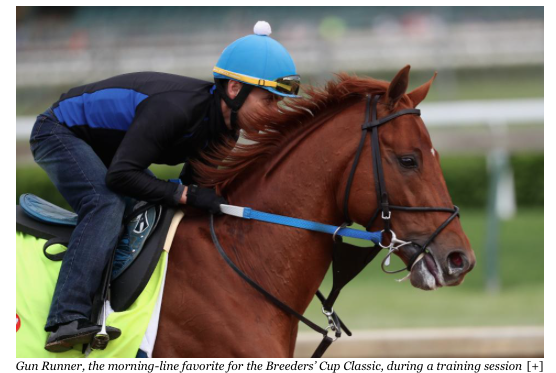 “I’m just trying to keep the weight on him, keep him happy,” Baffert said that morning. Baffert backed off a bit for the next work, when Arrogate went a half-mile in 50 seconds under jockey Rafael Bejarano on Oct. 3. “I stressed to Bejarano I didn’t want to do a lot, just cruise around there,” Baffert said. “I’m happy with him. Just got to keep him healthy. I want him to be really enjoying what he’s doing. On Oct. 10, Arrogate was sent through another fast piece of work, five furlongs in 1:00.20, again the best of the day at the distance. Six days later, Arrogate worked six furlongs in 1:13.20, and seven days after that, seven furlongs in 1:25.40. On Monday, Arrogate had his final drill, five furlongs in 1:00, again the best of the morning at the distance. Early Tuesday morning, Arrogate was sent by van from Santa Anita to Del Mar. He’ll get three days of training on the main track before the race. Baffert insists it was his management, not the surface, that got Arrogate beat this summer. Different race tactics will be used Saturday. Arrogate will be asked to stay closer earlier by jockey Mike Smith. “You have to be in it turning for home,” Baffert said. “You’re not going to make up a lot of ground. That’s the key going a mile and a quarter. You’ve got to stay within striking distance. 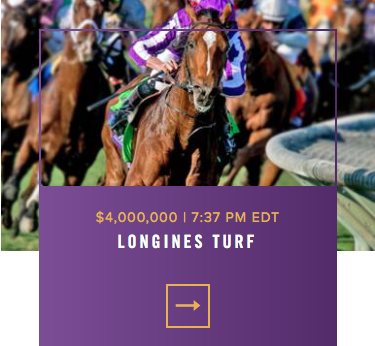 looms large in the Breeders’ Cup Filly and Mare Sprint. 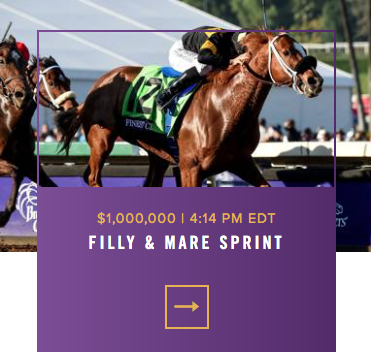 A full gate of 14 is pre-entered in the Breeders’ Cup Filly and Mare Sprint for Saturday, but just one name – Unique Bella – has dominated the conversation as the $1 million race draws near. A winner in 5 of 6 career starts, Unique Bella has awed even the opposing trainers of the 13 pre-entered against her in the seven-furlong Filly and Mare Sprint. Unique Bella, owned by the Don Alberto Stable, was knocked off the Kentucky Oaks trail with a shin injury in late March, after which trainer Jerry Hollendorfer decided to target the Filly and Mare Sprint, as opposed to the BC Distaff. A 3 1/2-length victory in the Oct. 8 L.A. Woman seems to have served its purpose as a comeback prep toward the goal. 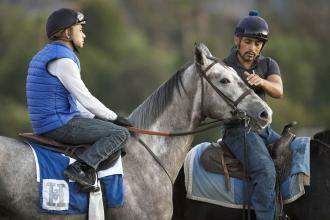 Unique Bella was scheduled to arrive early Tuesday at Del Mar from her Santa Anita base. Aside from a light training regimen, she was to school Wednesday through Friday, said Hollendorfer. “We’re taking nothing for granted, but yes, the filly has done very well since we put her back in training,” said Hollendorfer. Hollendorfer trained Constellation for her six most recent starts before LNJ Foxwoods turned her over to Baffert this summer. The 4-year-old filly has four stakes wins, most notably the Grade 1 La Brea in December, from 12 career starts. 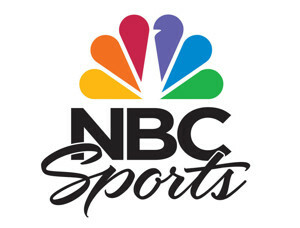 The “Jockey Cam” will be incorporated in NBC and NBCSN’s live coverage of the season-ending championships at Del Mar on Friday and Saturday. This marks the first time viewers can watch a jockey’s tactical decisions as a major stakes race unfolds. RACE FANS COMMENTS AND PICKS!